GOOGLE CO-FOUNDER SERGEY Brin says he sees little reason to release the accident reports involving the internet company’s self-driving cars because he believes there’s nothing new in documents withheld to protect the privacy of other motorists. Brin, who oversees Google’s fleet of self-driving cars, outlined his rationale Wednesday during a sometimes-testy exchange with a long-time critic at the company’s annual shareholders meeting in Mountain View, California. As part of his effort to show Google has nothing to hide, Brin disclosed that one of the company’s self-driving cars was rear-ended at a traffic signal during the past week. With that collision, Google’s self-driving cars have now been involved in 12 accidents while covering more than 1.7 million miles over the past six years, according to the company. The self-driving cars have never been at fault, according to Google, though a company employee was in control at the time of one crash. Google is planning to begin testing the latest version of its self-driving car around the streets of Mountain View and other nearby public roads this summer. About 25 of the pod-like, two-seat vehicles initially will be cruising around at speeds topping out at 25 miles per hour. Consumer Watchdog, a group that has been lambasting Google for years, is demanding that the company release the self-driving cars’ accident reports filed with the California Department of Motor Vehicles and other government agencies to give the public a better understanding of the risks posed by the vehicles. The Associated Press also has requested the records from Google and the DMV. 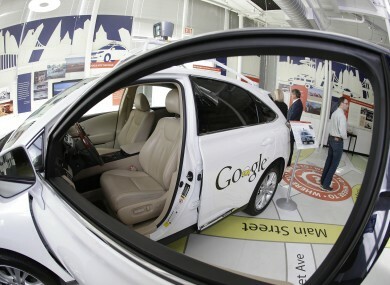 Both Google and the DMV have cited privacy concerns for keeping the reports under wraps. Even if the accident records were released with the names of the drivers redacted, Brin said the documents wouldn’t disclose anything different from a summary that the company posted online three weeks ago. Google says its self-driving cars have been rear-ended eight times, including the most-recent accident, side-swiped twice and hit by another vehicle rolling through a stop sign. “I suppose we could give more detail and we are open to that, but you are not going to learn anymore,” Brin told John Simpson, Consumer Watchdog’s privacy project director. Simpson told the AP that he believes the records would shed more light by at least revealing the dates, times and precise locations of each accident. The driverless cars are among several ambitious projects that Google has been funding outside its primary business of internet search and advertising. The list of far-flung initiatives include a contact lens that monitors glucose levels in diabetics and internet-beaming balloons hovering over remote areas of the world that have little or no online access. Google CEO Larry Page, the company’s other co-founder, describes the projects as “moonshots” that he hopes will make the world a better place. He assured Google shareholders Wednesday that “everything is getting better, in general, by quite a bit,” thanks to technology. “I think we should be optimists and be excited by all the things we are building and contributing to the world,” Page said. Email “Google's self-driving cars have been in 12 accidents, but none were their fault*”. Feedback on “Google's self-driving cars have been in 12 accidents, but none were their fault*”.